This example is particularly striking, because most of the time one of Macy Minnot’s greatest virtues is her alert, pragmatic engineer’s mind, but each of the novel’s main characters experiences at least one comparable moment. For clone soldier Dave #8 it comes the first time he experiences a universe beyond his barracks: at first “everything was new and exciting and charged with significance and the high resolution of reality”, and then “the connection between what he had learned and what he saw struck a bright snap of pleasure” (148-9). For space pilot Cash Baker (no, naming is not McAuley’s strong suit), it comes in the middle of a mission that involves diving into Saturn’s atmosphere: “The sky was deep indigo and seemingly infinite, the sun a tiny flattened disc that glowered at the hazy horizon, the centre of concentric shells of bloody light that rose towards zenith … He felt like the king of this whole wide world, an emperor of air, and told Vera that this place was definitely made for flying” (222). And for Sri Hong-Owen, scientist and (I would argue, against her protestations to the contrary) politician, it comes at home, in the part of Antarctica she has remade after the environmental upheavals of Earth’s recent past: “Facing into the cold, clean wind and thin flurries of snow, she could survey the entirety of her little kingdom”. Tellingly, however, Sri is the only one of the four characters to look beyond the immediate moment. She sees impermanence, “a mirage” maintained in the teeth of the second law of thermodynamics. “The world,” she muses, “must be free to find its own point of equilibrium” (168). Aside from often being vivid, clear writing, what I think all these moments do well is to give a flavour of what it is like to be human in this future: to be a fragile member of a fragile species, maintained by technology in the face of ancient, often empty, fundamentally inhospitable landscapes, and yet to find something resembling a moment of peace. An equilibrium between the noise of being human and the quiet of the universe. East of Eden, Ganymede, occupied a narrow crevasse at the southeastern edge of the dark and cratered terrain of Galileo Regio. The floor and sides of the crevasse were insulated and pressure-sealed with layers of fullerene composite and aerogel, and it was roofed with the same material … The settlement had been founded some fifty years ago by a group who believed that the other inhabitants of Jupiter’s moons had grown too soft, too bourgeois. Although there home was pleasantly bucolic, East of Eden’s citizens were austere and close-minded, keen on conformity, custom and civic duty, and they prized the acquisition of scientific and philosophical knowledge about all else. … Their government, a form of direct democracy similar to that of the city-states of Classical Greece or the early years of the Roman Republic, involved endless discussions (156-7). I think it’s clear that these sections are intended to be as important to the overall aesthetic of the novel as the character-focused moments I described above, in that one of The Quiet War‘s central goals is undoubtedly to build up a picture of a future solar system, one that eschews romanticization for verisimilitude. And in that goal, it is largely successful. The Quiet War is from that tradition of sf which is unabashedly didactic, devoted to political, technical and geographical detail, and while there are inevitable familiar elements (Dave #8’s tale, in particular, reminded me variously of the future-war parts of Stephen Baxter’s Xeelee sequence, and the clone workers in David Marusek’s Counting Heads), the range and coherence of imagination on display is impressive. The societies on Earth, which have turned environmentalism into a form of religion, and in the Outer colonies, which have started to embrace the more radical possibilities of fully participatory democracy and genetic modification, are convincing (although we see much more of Outer cities like East of Eden than we do of Earth). The technical innovations woven into the plot, from self-sustaining biomes to the “vacuum organisms” that support the colonists, are fascinating; and the stubborn insistence on portraying the various moons and planets as they really are (as we currently understand them) gives the whole enterprise a solid foundation. There are moments and passages when the sense that it really could be like this can make The Quiet War utterly absorbing. But I’m not sure the sourcebook stuff is necessary. Admittedly, I haven’t read many of the original “quiet war” stories which preceded the novel, and of those I have read most, such as “Second Skin” (1997) and “Making History” (2000), are set after the war; but I don’t remember them requiring such encyclopedism to make their point, and while a novel obviously has more space to play with, I don’t know that this was the best use for it. I’m not even arguing that the information needs to be woven into the narrative more elegantly; the problem is that most of the time, it already is. There’s nothing in that description of East of Eden, for instance, which Macy Minnot does not subsequently experience first-hand. She sees the colony’s buildings with her own eyes; gradually learns about its history and the temperament and interests of its citizens; and gains first-hand experience of living in a democracy – albeit negative experience, as the system is manipulated against her. You could perhaps construct an argument in favour of the lectures that has to do with pacing and tone: they help to maintain the measured pace and sober tone that drain the sensationalism out of the novel’s more action-adventure elements. Adam Roberts’ review acknowledges the limitations of the novel’s style but finds, ultimately, that its “quietness” is its great strength. There’s something to that: the implied narrator is native to this future and thus takes moments such as, for example, the scene in which Macy is subjected to casual torture as unremarkable, enabling them to be presented with powerful understatement in precisely the way Roberts describes. A less utilitarian perspective, or one that sought greater historical distance, would lessen this effect. 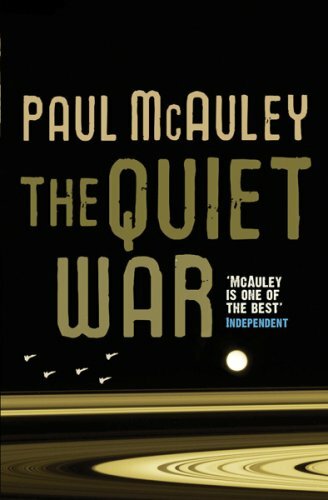 No matter how carefully, how impressively the knowledge that went into The Quiet War was orchestrated, however, I found myself missing the wit and irony that distinguished the other Paul McAuley novels I’ve read recently (the Arthur C Clarke Award-winner Fairyland, and last year’s Cowboy Angels). Things do improve in the novel’s punchy closing stages, which bring the question of how humans can live in the solar system to a pivot point, and slingshot most of the characters onto interesting new trajectories; a subplot that sees Dave #8 infiltrating an Outer colony is a particular highlight, as is a climactic encounter between Sri and an Outer “gene wizard” she’s been seeking for much of the novel. But too much of the quietness of The Quiet War is a lifeless quiet, which could have done with a bit more human noise. For all its datedness, there surely can’t be many sf readers for whom this first sf longing, the sense of easy destiny implied when the final image of “ripe fruit” recalls those planets hanging in the sky, will not strike a chord. But a couple of hours later, Leo has already changed his mind, adopting a more contemporary attitude — “The future isn’t something waiting ahead of us any longer. We’re living with it. It’s with us. It’s everything. It’s here” (17). Anyone who’s read MacLeod’s superb novella “New Light on the Drake Equation” (2001), which portrayed an old man living in a future science fiction hadn’t prepared him for, could at this point be forgiven for thinking they know where Song of Time is heading, but though there are similarities, the novel goes further than the story. The future in Song of Time is a shifty, uncertain thing, sometimes promising, sometimes malign, always bound up with the characters’ sense of themselves. When Leo becomes sick, for instance, infected by a modern plague – an engineered virus that causes increasingly severe food intolerance in people with caucasian heritage — he becomes increasingly bitter about the dream he shared with his sister. A planned trip to a Venice afflicted by subsidence and rising sea levels becomes totemic; “What do you think the future holds for me?” (41), he demands. Later, after a family tragedy, Roushana’s mother insists to her that “The past’s gone, darling. The hopes and the theories mean nothing. All we’ve got left is the future” (77). In Roushana’s present, an avatar evangelising about the benefits of a digital afterlife claims that “The future isn’t the Earth” (159), but belongs to a form of life that can become “the breath of the sun”, and travel to the stars. But perhaps most definitive is Roushana’s assertion, when worn out by the process of remembering, that “The past is gone. So is the future. All that remains is me” (275). Earlier, the doctor who explains to Roushana how her memory-crystal implant should work puts it even more plainly, in the course of reassuring her that not to worry if some memories are biased, or painful to recall: “This isn’t supposed to be some impersonal history — it’s the reflection of your true nature which counts” (153). And MacLeod holds true to that credo throughout the novel. 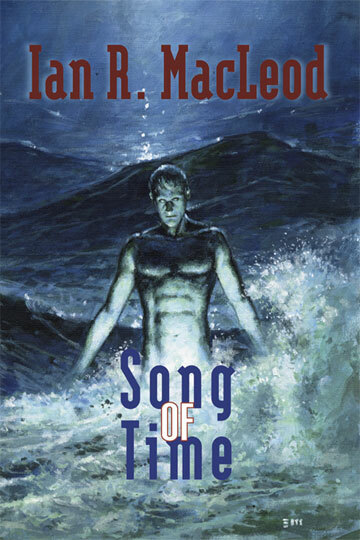 This is not to say that Song of Time is a story in which the sf elements are window-dressing — although on the surface it seems less essentially sfnal than something like The Quiet War, it ultimately turns on a choice that only the sfnal elements could enable. But the narrative is grounded in a different way, in emotion rather than fact. And it’s quiet in a different way, too. Inevitably, Roushana and her family are caught up in some of the century’s notable events, but just as many happen off-screen, and there are tantalizing references to “the sink cities of Southern Europe” (5), or “machines which mine the distant planets” (45), or other such details. Together with the ways in which the technological advances in medicine, computing and other fields are unobtrusively worked into the background, this teasing gives MacLeod’s future history a sense of depth and solidity; yet the closest we get to a lecture or a panorama is the occasional paragraph in which Roushana describes a place and time in the course of describing how it felt to be there, then. Initially, it has to be said, that the flashbacks are by far the more compelling aspect of the novel, describing with precision and force everything from the suburbs of Birmingham to a devastated India to a baroque Paris in the throes of artistic and political ferment. (This last is a tour-de-force.) The present-tense episodes which punctuate these reminiscences keep the novel moving, but for a while seem as though they will not move beyond mere functionality. But perhaps I was more resistant to them than I should have been, given that I was utterly convinced I knew what was going on with Adam, and utterly wrong. Certainly, as we get to know Roushana better — in her determination, her sometimes coldness, and her passions — and as she comes to know, and increasingly to confess to, Adam, the present-tense sections come into their own. The final fifty pages or so bear down on the relationship between Roushana and her exuberant, performative husband Claude, to unearth how Claude’s death still shapes Roushana’s present. In spite of their melodramatic qualities (a great raging storm underlines the emotional intensity of the climactic scenes), they build to a piercing, haunting conclusion. And through it all, inescapably, there is music. Although we don’t get much detail about Roushana’s career – on the grounds that it’s a matter of public record, and that she thus needs to spend less time remembering it – what we do get renders the emotional stresses and rewards of a musical life as viscerally as anything I’ve read since Michel Faber’s The Courage Consort (2002). Moreover, the novel as a whole is marvellously inclusive, even inspirational, in its appreciation of “high” culture, although when it comes to describing music directly, MacLeod perhaps falters; describing a mid-21st-century genius’ work “as if Beethoven had written trance”, for instance, seems to be trying a bit too hard. But in the same way that Song of Time is less about the reality of the future than the idea of it, it’s less about the specific character of music than the feelings it inspires and the atmosphere it evokes. The “song of time” within the narrative takes advantage of various technological innovations to constantly evolve: any copy of the score which is ever opened will be subtly different to any other, according to rules laid down by the original composer, growing and changing (as memories grow and change). It’s a grounded sfnal speculation – the music of a culture in which access to recordings is ubiquitous – but also serves as a hymn to the power of the present moment, and a reminder that nostalgia, whether for the past or the future, can be a trap. It’s a truism to say the same of the best novels, that they change not just from one reader to the next, but from one reading to the next, demanding to be revisited, so perhaps the most generous praise I can offer of Song of Time is to say that the act of reading it feels just as ephemeral, and essential, as the music to which Roushana Maitland devotes her life. I’ve just finished rereading The Quiet War – I stayed way too late 3 nights ago to finish it so I needed a more leisurely reread – and I liked it a lot, being more in agreement with Adam Roberts’ review than with this one. I’ve been reading all of Paul McAuley’s novels since his debut 20 years ago and I skipped only the recent techno-thrillers though still reading his short stories, especially the ones in the Greater Brazil universe of this book – I read just 2 of his thrillers Wide World and Secret of Life which I liked as techno-thrillers go, but I rarely read such – so I was excited by his return to wide-screen sf and the book did not disappoint in my opinion. Oh, I’m definitely in the minority on The Quiet War; Gary Wolfe’s review in Locus was pretty glowing, too. (I think I probably also like Cowboy Angels more than the average.) But unfortunately too much of the book just felt leaden to me. Definitely this review of Song of Time vaulted it higher on my to read list so it’s first in line when I want a book like it. Ian MacLeod is a great stylist in my opinion and Light Ages has been a top 5 novel for me when it was published but its sort of sequel – House of Storms – disappointed me badly after a great beginning third. I still kept reading his short sf when it came my way and I hope he will write more interesting novels.